Cyrano de Bergerac is playing at the Guthrie Theater now through May 5. A Christmas Carol plays now through December 29 in the Wurtele Thrust Stage at the Guthrie Theater. Frankenstein – Playing with Fire by Barbara Field plays at the Guthrie now through Oct. 27. The Legend of Georgia McBride is funny as hell and raw to the core and plays at the Guthrie through August 26. West Side Story runs on the Wurtele Thrust Stage till August 26th. It runs approximately for 2 hours and 35 minutes with one intermission. An Enemy of the People plays at the McGuire Proscenium Stage through June 3 and is 1 hour and 35 minutes with no intermission. There are tickets available from $29-77. Even the horrible weather this past week could not keep me from a lovely evening at the Guthrie Theater on Friday for the opening night performance of Guess Who's Coming to Dinner. This play, by Todd Kreidler, is based on the screenplay by William Rose. The iconic film from 1967 originally starred Spencer Tracy, Sidney Poitier and the wonderful Katharine Hepburn. The film at the time was one of the few films around the time period that depicted an interracial marriage in a positive light. It was also nominated for an outstanding 8 Academy Awards including Best Picture, Best Director and Best Actor to name a few. Guess Who's Coming to Dinner is also a lovely addition to the Guthrie's season as they recently closed the show Familiar which also deals with the differences in humane society when they are confronted with another culture that differs from their own. Guess Who's Coming to Dinner, which takes place in the 60's, tells the story of a young lady named Joanna who returns home from Hawaii a few days earlier than expected. She surprises her parents, Matt and Christina Drayton, a progressive middle-aged couple living in San Francisco, when she walks through the door with Dr. John Prentice, an African American doctor who is 11 years older than her. After telling her parents how in love they are, they hope to receive their blessing for marriage...by the end of the day. While her parents are extremely liberal they must put their values to the test and put their money where their mouth is when it is confronted within their own family. As always, I need to call out this absolutely beautiful and spectacle set that is designed by Matt Saunders. The set honestly makes the Wurtele Thrust Stage look even bigger than it already is. It's spacious and inviting with a 60's flair of color and decoration, yet it feels refreshingly modern with geometric angles and shapes. 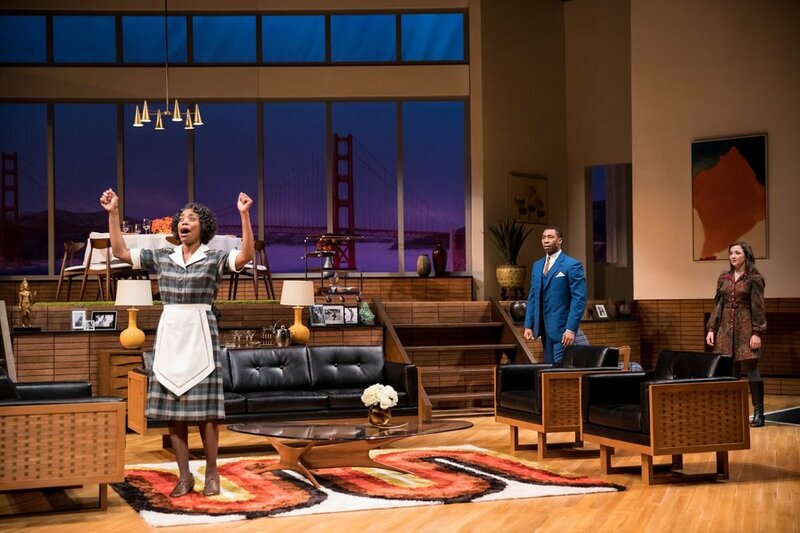 This is another perfect example of how the Guthrie can transport it's audience into the play as we looked out the giant dining room windows upon the Golden Gate Bridge. The script itself is well written...at times. I'll get to the negative later. I will admit that it does start quite slow however that being said, once the action starts it does not stop and continues through the end of the second Act. While this show is a very though-provoking show and deals with themes of racism, family dynamic and love, it is still labeled as a comedy through side-eye moments, hilarious clap backs and even jokes through uncomfortable situations. The cast does a phenomenal job in keeping a light air while still getting the point across with the more serious and dramatic themes. It's a fantastic balance of comedy and drama. To bring something like this to the stage for hundreds of people to see, you need to have a stellar cast that can get this point across without becoming too preachy. I think Director, Timothy Bond, does that beautifully. Regina Williams, who plays the families maid Tillie, is the biggest comedic anchor in this show. Without her, I think the show falls apart. Sally Wingert, who plays Christina Drayton, is the next best thing about this production for me. Wingert balances those comedic moments so naturally and really roots them in a sense of realism. LaBen early, who plays Joanna's fiance Dr. John Prentice, is my next "actor to watch out for" because his performance is absolutely brilliant. His monologue to his father about being a man is truly inspiring and something everyone should see. Other highlights in this cast include Michelle Duffy, who plays the subtly racist Hilary St. George, is a terrible character...but played by a phenomenal actress. I think a lot of people know a Hilary. She's the definition of the type of person we all may know who says "I'm not racist but..." and she plays it wonderfully. David Manis plays Matt Drayton whose character is conflicted with what he preaches and what he may actually believe without realizing it. Peter Thomson plays Monsignor Ryan and is the biggest "voice of reason" in the show as he is a man of faith and calls Drayton out on his harbored prejudice. There is also Maeve Coleen Moynihan who plays Joanna Drayton. Personally I thought Moynihan lacked energy and a variety of choices in the first act but picked it up in the second. Guess Who's Coming to Dinner is a fantastic production however it does have some flaws. I think at times the audience didn't get it with some of the darker themes of the show. As I mentioned, it is considered a comedy however it's rooted in realism. These conversations did happen back in the 60's and I'm certain it happens still now. At times I felt the script pushed the comedy too much to the point where it overall out shines the biggest theme of all and that's the idea that many of us preach acceptance but some do not walk the walk. Guess Who's Coming to Dinner is still a fabulous production and I really recommend everyone to see it. There are some fantastic moments through out the show. This adaptation of the iconic film will be playing at the Wurtele Thrust Stage through May 27. Tickets can be found here. No matter who you are, where you've been or where you come from, you'll see yourself and some of your family in this new relatable and hilarious comedy. Whether you’re black or white. Whether you’re single or married. Whether you have siblings or are an only child. There is something for everyone in the Guthrie’s newest production. Familiar opened at the Guthrie last week and I can honestly say it’s one of the wittiest shows I’ve ever seen. It’s written by Danai Gurira (Black Panther, The Walking Dead) and is a testament to just how talented of a writer she is. In 2015, she made her writing Broadway debut with Eclipsed which made headlines for it’s all female and black cast and creative team. While Eclipsed had more of a darker tone to it, Familiar is quite the opposite with sharp wit, hilarious dialogue and an all-around relatable family, no matter where you come from. Familiar takes place in a suburb of Minneapolis, Minnesota during the late winter season. The story opens on a Zimbabwean family that is getting ready for their eldest daughter’s wedding, Tendikayi (or Tendi). Nyasha, the youngest daughter, is a free spirit and musical artist who just returned from a trip to Zimbabwe to attempt to learn more about her family’s culture while her mother, Marvelous, attempts to keep them rooted in their new American life. One by one more family arrives at the house including Tendi, her fiancé Chris (who happens to be white), and Marvelous’ two sisters Margaret and Anne. Tendi surprises her mother with the arrival of her aunt Anne as she is to perform the Roora (or bride price) in honor of her family’s heritage before the wedding. The journey of the evening takes plenty of twists and turns from jaw-dropping family reveals to hilarious interactions that almost had me falling out of my seat. The cast is marvelous, and I truly mean that in every sense of the word. Each actor full embodies their character and respects them as if they are a real person they know. Because of this I can’t simply write about one or the other, so I must take the time to quickly mention how fantastic each and every actor was in their role. Harvy Blanks plays the patriarch of the family, Donald Chinyaramwira and really does pull at the heart strings towards the end of the show. Sha Cage plays Tendi and is perfectly cast and must go through a tremendous amount of emotional range throughout the two acts. She does this beautifully and effortlessly. Quinn Franzen plays Chris and is so stupidly charming that I think I went weak at the knees even whilst sitting. He really does care for Tendi no matter what the situation is and manages to stick by her side throughout the crazy evening. Perri Gaffney plays Dr. Marvelous Chinyamurindi and is one of the most relatable characters in the entire production. She’s the type of mother that will do anything for her children and no matter how bothersome she may be to her children, you know she does it out of love and only wanting the best for her kids. Austene Van plays Professor Margaret Munyewa (Marvelous and Anne’s other sister) and really does a wonderful job of keeping the mood light when the going gets tough. Aishe Keita, who plays Nyasha, is head strong and eager to continue learning about her families past and heritage. She honestly reminded me a lot of myself. Wandachristine, who plays Anne Mwarimba, is the comedic anchor of this show. Her timing is spot on and lends her self to each scene being a force on stage. Last, but certainly not least, is Michael Wieser who plays Chris' brother, Brad. While Brad isn't on stage as much as the rest, he still manages to be one of the most memorable with the hysterical Act I finale, which I won't spoil, while also being extremely endearing to Nyasha. One of the heaviest themes of the show that I wanted to touch on is not only family but sisterhood. The younger generation mirrors the older generation in such unique and intricate ways. Tendi is the one who leads a “normal American life” as a lawyer and yet she is the one who initially reaches out to her Aunt Anne, who currently still lives in Zimbabwe. Tendi teters on the balance of her families roots and her families values now in America. Meanwhile there is a power struggle between Nyasha, who wishes to reconnect with her families roots while her mother wants nearly nothing to do with it. It’s an interesting balance of seeing where all these women are with their connections to their family’s heritage. Familiar is a witty, hilarious and touching show about what it means to know your family’s history. Taibi Mager, the director, leads a cast that has impeccable comedic timing and pacing of the show. Gurira fabulous writing shows off how versatile of an artist she is. 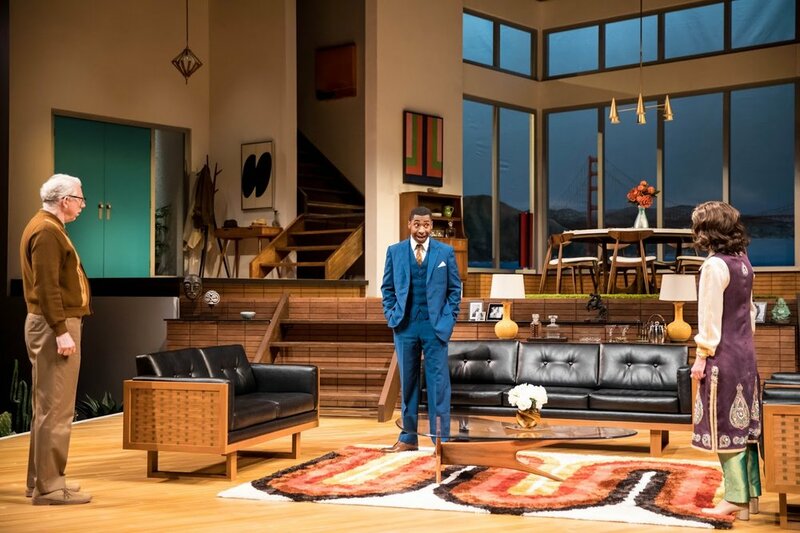 Familiar plays at the Guthrie through April 14, 2018. This past winter I attended a production of Blithe Spirit at the Guthrie. My best gal pal, Sofie, was in town visiting from New York and saw in her program that the Guthrie was producing Indecent by Paula Vogel in 2018. I remember how excited she was not only that the play was being produced but that I would have the chance to see it. After seeing how excited she was, and she hadn't even seen it personally in NYC, I knew I had to experience it for myself. Indecent is inspired by the Yiddish playwright, Sholem Asch and his widely produced, yet ultimately censored, 1906 play The God of Vengeance. The God of Vengeance is the story of a Jewish brothel owner who lives with his wife, a former prostitute who used to work for him, and their overprotected daughter who has a reputation of being the purest of girls. The family lives above the father's brothel and soon his daughter falls in love with one of the girls downstairs. However Indecent is an emotional and captivating, multilayered script about behind the curtain an The God of Vengeance came to be and ultimately how it was censored. It tells the story of what the acting troupe had to go through to have success on Broadway ultimately leading to their arrest after their debut. Even two days after seeing this script, I'm still trying to grasp how to put into words, what I saw. What I experienced. Lately, I've been seeing a lot of powerful plays that leave me utterly speechless. I said it in my last review of The Humans but I feel as if my writing isn't up to par with the pure genius that is this play. Stella Adler once said "The theatre was created to tell people the truth about life and the social situation" and that quote perfectly captures what this play is and was. As you can probably tell already, I was in awe. I absolutely loved this production. I'll be honest. I was very branded as an "only musical theatre type guy." But this production reawakened my love for plays. It was technically "a play with music" Right away, upon walking into the theatre I had already begun analyzing the stage through the huge broken down theatre that was built on the Wurtele Thrust Stage. This play-within-a-play literally has...a theater-within-a-theater and it's lovely. You can even see a time-lapse video of it here. What I loved about the set, designed by Arnulfo Maldonado, was how it complimented every aspect of the production. Cast members hauntingly sat in the abandoned seating as audience member took their seats. Piles of abandoned suitcases, pictures and other items scattered across the edge and back of house. This, at least to me, made so much sense after the production as it was a tribute and reminder to those who lost everything during the Holocaust, a subtle plot point towards the end of the production. Projections were cast on the different pieces of the set by projection designer, Alex Basco Koch. The projections serve multiple purposes including letting the audience know when time has passed or what language the cast is speaking at that moment (usually Yiddish or English). This was an amazing detail because it was fascinating to see this brilliant cast flip on a dime. It truly shows how talented they are as they speak perfect English through the whole production, symbolizing the character's native Yiddish language, but then broken English at times symbolizing them trying to speak English. It's hard to write out but trust me, it was fantastic. The projections almost serve as stage directions for the audience, something I've never seen done before. Whenever the cast actually did speak in Yiddish (mostly when they sang), the English translations would flash across the screen while the actual Yiddish writing shined on the floor. The cast was six actors with three musicians (who almost served as actors in the show as well). The cast served as multiple roles and I thought they all did a superb job in differentiating the difference between each character. They were passionate and respectful while portraying these people. Sally Wingert, always a Twin Cities favorite, makes an appearance in this production as well and adds the perfect amount of zing and spice to each role. She kept me from absolutely sobbing through the entire production with her well timed comedic moments. Ben Cherry (below) plays Lemml, one of the leading characters and leading people who kept The God of Vengeance playing. Cherry was also in the original Broadway production and now making his Guthrie Debut. What a production to debut your talent to the Twin Cities. He was absolutely incredible. Whether it was making the audience laugh as he tried to learn English or making us cry (I cried a lot...) through his pleas and desperation to continue his work, I was completely drawn in. Never once did he let the audience look away from the stage. Paula Vogel, the playwright of this marvelous production, should be very proud. The dialogue and relationship she's created with another playwrights work is truly a masterpiece that should be forever taught in theater classes around the world. Indecent is one of the most important pieces of theater I've ever seen in my life time and I mean that 100%. It's powerful and a story that everyone should know. It's the epitome example of how art can start a revolution, can change lives and create change. Indecent is story-telling at it's finest. I honestly can't say more great things about it. I fully intend on seeing it again before it leaves. Indecent plays at the Guthrie Theater through March 24th in the Wurtele Thrust Stage. Ticket and more information can be found here. *Photo Credit to Dan Norman and provided by Guthrie Theater. Stephen Sondheim is not only one of the great musical theater composers to ever live, he is also my absolute favorite. So you can imagine my excitement when I was invited to review Sunday in the Park with George at the Guthrie Theater. As much of a super fan of Sondheim as I am, I must admit this was my first time ever seeing or hearing a production of Sunday in the Park with George and (SPOILER ALERT) I loved it. It was beautiful, moving and included wonderfully done direction by director Joseph Haj. 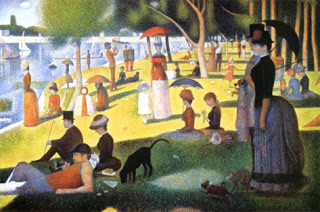 Sunday in the Park with George is a musical inspired by George Seurat's famous painting A Sunday Afternoon on the Island of La Grand Jatte. With music and lyrics by Stephen Sondheim, a book by James Lapine, Sunday in the Park with George originally opened on Broadway in 1984 and starred Mandy Patinkin and Bernadette Peters. The musical won the 1985 Pulitzer Prize for Drama and nominated for a total of 10 Tony Awards (winning Best Scenic Design and Best Lighting Design). The musical takes a deep look into what it is like to be an artist. The word artist is a very subjective term as both acts of the show take different approaches to the definition. The first act revolves around George Seurat (played by Randy Harrison) who is a dedicated and serious painter. His latest masterpiece engulfs his entire being and even risks his relationship with his lover, Dot (played by Erin Mackey). The second act takes place a century later, where George's great-grandson is working as a more contemporary artist. I fell almost immediately in love with the set upon walking into the Wurtele Thrust, designed by Jan Chambers. It had the perfect amount of simplicity and sophistication for this Sondheim production. A large white outline frames part of the plain blank stage. Behind that a large white cloth hangs from on the stage left side and behind that a black scrim, hiding the orchestra. It's an obvious yet brilliant metaphor for a design. As the actors moved around on stage, they themselves were painting scenes across the white canvas of the stage and it quite honestly was one of my favorite parts of the entire production. As the first act ended, George began moving different actors around the stage, in the outline of the canvas, in a frantic way that left some audience members confused. It wasn't until they were all set that a larger version of the famous painting flew in behind the actors that the audience understood and cheered. The performances by all the actors were remarkable. It is the famous Guthrie Theater after all, did I expect anything less than superb? As someone who has performed in two Sondheim shows myself (Rapunzel's Prince in Into the Woods and Charles Guiteau in Assassins), I know how difficult his music is. His harmonies and master of the English language is difficult and rewarding. The entire ensemble of actors had their work cut out for them with this musical and they were fantastic. Everything from Dot's mouthful of words and clear control of breath support in the opening title song to the staccato ensemble verses in "It's Hot Up Here." Harrison's singing is not to go unnoticed as well. It was soft and tender at times while his belts filled the performance space beautifully. The overall tone and mood of this production is really something special. As I mentioned before, I had never seen Sunday in the Park with George and I was quite surprised as to how many times I found myself laughing out loud. Mackey had the audience in the palm of her hand the entire time, as we laughed with her comedic timing but also felt for her during her times of sorrow. While Harrison's character often was not trying to be funny, it was his blunt honesty that made me laugh. Sometimes theater is not for everyone, and I believe this show might be one of those...or at least those who are not willing to try. I heard a few audience members say they did not enjoy the time skip along with the fact that they didn't understand how George could see his ancestors and the people who originally posed for the A Sunday Afternoon on the Island of La Grand Jatte painting. At times like this audience members really should follow, what I believe to be a common practice for theater goers, suspension of disbelief. Now there is a difference between suspending disbelief and just lack of a plot that makes sense however this is the exception that if you're going to see this production, you need to be willing to just go with it. Sunday in the Park with George is a beautifully painted production of Sondheim's beloved masterpiece. The music is stunning and the actors bring so much a production that many would die to be apart of. It is the production to see this summer. Sunday in the Park with George plays June 17 through August 20. More information can be found here.